My most recent post from Connected Mom. Questions are welcome, as are your own pros and cons! A friend of mine, pregnant with her third little one, recently asked for some recommendations for carriers. Since everyone has slightly different needs, I broke it down to some pros and cons vs. just giving a recommendation for one type of carrier. What the best one is for you can depend on a number of factors. I'm sure she won't mind that I share this here. Mei Tai, only with buckles instead of ties. They are super padded and supportive, but I think the MT gives a little more freedom of how you want to carry (high back or low back, front, hip, tied tibetian or more like a back pack). You also typically need an infant insert (or a rolled up blanket or something) when they are smaller, so there is that additional item to futz with. I have to say, after borrowing a Beco from a friend to use for the MS Walk this past week, the added support is wonderful. I was able to carry Gwen for the full 5.5 miles with no problem. My one complaint, was that it was a little annoying getting Gwen up and down from the back carry for her potty breaks. If I could have taken the whole thing off, or had a chair or table to lean on, it probably would have been easier. I used my wraps a lot when Gwen was smaller, since they are endlessly adaptable (my favorite carry was the double hammock), offer good support, and are pretty. :-) I can't say enough about the adaptability and support of wraps, but they do have a bigger learning curve, and take some time at first. Once you've practiced a while, it gets easy to pop them up, but at the beginning tying is slower. There are tons of videos online to show different carries, so if you are interested, check them out. One con, they are not as great as a MT or a sling for taking them in and out a lot (aka if you are planning to put them up and keep them up while you do some chores or take a walk, great... but it would have been a bit of a pain for me this past weekend to untie and retie Gwen each time she had to pee!). I also have a ring sling. I didn't get it until Gwen was a toddler, but it can be used from newborn on. They are easy to use, easy for on/off/on/off situations, and can be gorgeous. They aren't quite as supportive as other carriers though and the weight isn't as equally distributed. You could probably carry your newborn for quite a while before you notice it, but would notice sooner with a toddler. They can still be quite comfortable though, and I like them for walks when I knew Gwen would want to be down a lot of the time, but what to get up to rest periodically. I can pop her in without even stopping. If you did get one, get a ring sling... not one of the bag slings, which make proper positioning hard and can be dangerous. Ring slings are fine and safe for newborns, as long as you are careful and get good positioning (resource here). Stay away from "crotch dangler" carriers (ie. Bjorn, Snuggli and Infantino) as they are less comfortable for Mom and Baby (weigh is not distributed as easily), and are not ergonomically good for baby. More about that here. 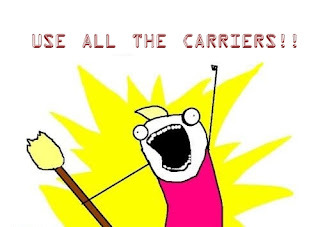 So, I'm in the Use All The Carriers! camp, but I guess my favorites are wraps and the MT for different situations. If someone were only going to get one carrier, I'd probably recommend a MT, with a soft structured carrier being a close second. I hope this helped, and please let me know if you have any other questions. Becoming Mama's has an amazing Guide to Babywearing.